Have we become so lazy in this fast paced, Twit-Faced, You-tubing world that we can not wait to boil water anymore? I guess so! Thats why today’s gift is the must have for everyone on your Christmas list–The Pasta Boat allows you to make pasta for everyone in Italy (or just for your nerdy kid that cant get a date in college sitting in his dorm room on a Saturday night) right in your microwave! The days of foul tasting food from the nuker are long gone and you too can make a carb-laden ecstasy inducing noodle fest in just minutes by using the Pasta Boat. 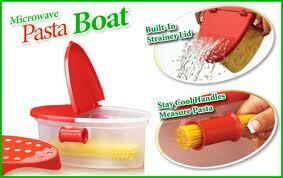 The Pasta Boat also comes with a veggie strainer (you remember what your mom said about vegetables, don’t you?) and a cool portion measurer thingy that is also the handle just in case you have no idea how much spaghetti you will need. Lastly you just have to love the host of the infomercial: Cathy Mitchell. 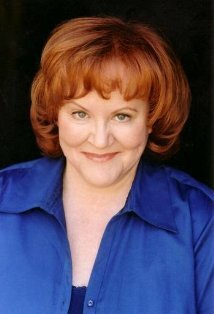 She reminds me of Grace (Edie McClurg) in one of the best movies of all time: Ferris Bueller’s Day Off (1986).